By the late nineteenth century, the United States was producing millions of yards of roller printed cotton fabric each year. One of the most successful print works in the northeast was Cocheco Mills of Dover, New Hampshire, which produced textiles for fashion and interiors. Their fabrics were well-designed and affordable, which meant those in the lower and working classes could wear clothing made from colorful and attractive cotton prints. In fact, women’s magazines of the period, like Demorest’s Monthly Magazine, hailed the virtues of humble cotton prints for their ability to brighten and refine everyday clothing. In a dyer’s record book from the 1880s entitled “Shirtings,” pages 4-5 show white cotton swatches printed with small designs of shaggy running dogs and cranes standing in water. Shirting fabrics typically have small, isolated motifs printed in one or two colors on a white or off-white ground. They were non-seasonal and cheap to make, so many textile mills produced whimsical variations on a basic style that didn’t see much change year-to-year. Sample, ca. 1876, Gift of the Fall River Historical Society, 1939-56-9. As the name suggests, shirting fabrics were used for informal clothing for adults and children. Tiny designs of flowers or meandering vines could be used to make blouses, aprons and wrappers for women and girls, while those with designs of roosters, horses, playing cards, and sports equipment were used to make shirts and handkerchiefs for men and boys. From about 1870 through the 1880s, shirting fabrics with sports-related motifs became very popular and featured small patterns with bicycles, tennis rackets, spurs, and horseshoes. 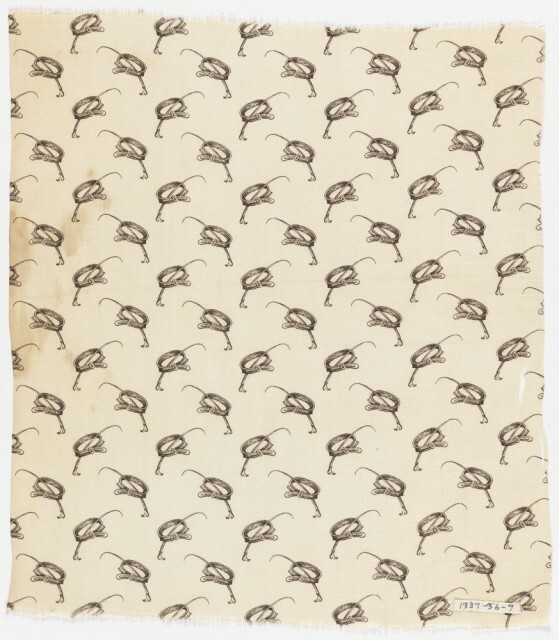 In the 1870s, American Print Works of Fall River, Massachusetts produced this seemingly straightforward shirting fabric with a belt and riding crop that illustrates how the simplest of designs can show movement and vitality. Dyer's record book, 1882–1888, Gift of Frederick J. Whitehead from the collection compiled by his father Cornelius Whitehead at the Pacific Print Works of Lawrence, Massachusetts, 1945-55-41.